8 December 2002 Annual Carol Service. The annual Carol Service was held in the Town Hall, Carrickfergus. The Service was very well attended and those present enjoyed the occasion. The offering will be donated to charity. Our thanks are offered to Rev McFarland for conducting the Service and to Magheramourne Silver Band for their music. 22 October 2002 Election of Officers. Best wishes to those who were re-elected or elected to Office for the first time. Several changes took place with two new Officers being elected and others moving to new positions. The District Committee also gained new members. Full details are available from the District Secretary. 12 July 2002 Boyne Anniversary. The Districts of the East Antrim Combine held a very successful parade that was enjoyed by those taking part and spectators alike. This was the first time since 1990 that the 12 July Parade had been held in Carrickfergus. The District Lodge would like to thank all those who helped in any way to make this event such a success. 23 June2002 Widows Fund Service. New regalia for the use of the District Lodge was dedicated at the Widows Fund Service held in Carrickfergus Congregational Church. One of the most successful and enjoyable Pageants for years took place. Many visiting brethren and bands participated, several being in period costume. Junior Brethren and Sisters travelled from Liverpool and added to the occasion being dressed as William and Mary and other members of the Court. The Officers and Members of Carrickfergus District Loyal Orange Lodge would like to sincerely thank those Districts, Lodges, Apprentice Boys Clubs, Bands, and individual Brethren who attended and helped in any way to make this event such a memorable one. Photographs are available elsewhere on this site. 24 May 2002 Charity Gift. 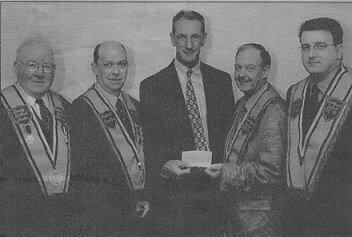 Carrickfergus District Lodge made their annual donation to charity and this year The Ulster Cancer Foundation were chosen by the members as the charity we would donate to. The offering from the Carol Service together with other donations was presented to the Ulster Cancer Foundation in The King William III Memorial Orange Hall. The sum of £600 had been raised to help the Foundation in their much needed work. The Worshipful District Master, Officers, and Members of Carrickfergus District Lodge deeply regret the death of Her Majesty Queen Elizabeth, the Queen Mother. We extend our heartfelt sympathy to Her Majesty The Queen on the death of her Mother. Our prayers are with the Royal Family at this time. has barred a loyal order Easter Monday parade from the lower Ormeau Road in Belfast. The commission has ruled that the annual parade by the Apprentice Boys of Derry will not be allowed to cross the Ormeau Bridge. The decision on Monday evening followed opposition (and threats) from nationalist residents from the lower Ormeau area. According to Gerard Rice spokesman for the residents, a decision to grant permission for a parade would be resisted by residents (previous item). The commission said that in making its decision, it had paid particular attention to the fact that this year marks the 10th anniversary of the Sean Graham betting shop murders. (Absolutely nothing to do with any Loyal Order). Route restrictions have also been imposed on another Apprentice Boys parade in Castlederg. From The Sunday Business Post Online. Residents of the Lower Ormeau Road in Belfast have been warned that an Apprentice Boys parade may be permitted to march through their area on Easter Monday. Despite an appeal to the Parades Commission by the relatives of five people killed by loyalists on the Lower Ormeau in 1992 not to permit such a parade, residents have been told of plans to grant a request from the Apprentice Boys. "There is growing concern about the Apprentice Boys being allowed to parade down the Ormeau Road on Easter Monday," said Gerard Rice, a spokesman for the nationalist residents on the Lower Ormeau. He said a delegation made up of relatives of those killed in the Ulster Defence Association attack on the Sean Graham bookmakers shop in February 1992 received a sympathetic hearing in their recent meeting with the Parades Commission. However, sources in the Northern Ireland Office are believed to have expressed a view that the Apprentice Boys should be allowed to parade down the road this year in their feeder parade to a larger march in Derry on Easter Monday. In recent years, permission has been refused to the Apprentice Boys who have not marched down the Lower Ormeau since 1994 although permission was granted last year. However, the planned parade was cancelled due to the foot-and-mouth crisis in the North. According to Rice, a decision to grant permission for a parade will be resisted by residents. "A decision to allow a parade will send a message to the community that they will never be freed of sectarian parades," he said. Members of Woodburn Ebenezer LOL 787 unveiled the newly named "Robinson Room" in Woodburn Orange Hall. The room was named in memory of Bro William Robinson who was for many years a highly respected member of LOL 787. Bro Robinson who had received his 50 year service jewel a few years ago was one of the most dedicated members during the Orange Hall renovation program. The Lodge said that they were proud to remember Bro Robinson by renaming the room in his memory as he had made a major contribution to the history of the Lodge. He helped to rejuvinate the Lodge and had spearheaded the campaign to have the Hall refurbished. 18 February 2002 "Parity Of Esteem ?" 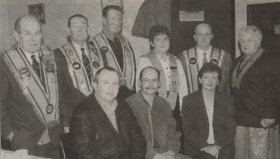 Martin Meehan, a former IRA commander in Ardoyne, made the remarks on the republican propaganda film, which was sent anonymously to The Observer . His comments undermine claims by Sinn Fein that the party is trying to reach an understanding with Protestants and unionists. At the beginning of the tape Meehan is seen arguing with a line of riot police during protests against an Orange Order parade passing by Ardoyne last summer. Antrim Borough Council in their web site ( http://www.antrim.gov.uk ) describe Martin Meehan as follows. "Councillor Meehan is a member of the Environmental Services Committee, Public Services Liaison Committee, Equality Steering Group, Lough Neagh Advisory Committee, Lower Bann Advisory Committee, and the Police Liaison Committee". 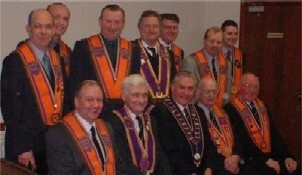 The installation of District Officers for 2002 took place in The King William III Memorial Orange Hall. Many visitors from County Antrim Grand Lodge and Belfast County Grand Lodge as well as neighbouring District Lodges were present.